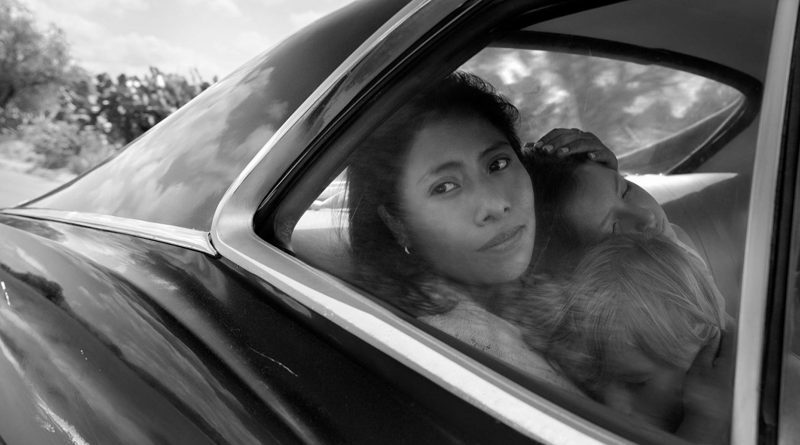 First-time actor Yalitza Aparicio is a housemaid living with a boisterous family in the Roma section of Mexico City over the course of a tumultuous year. Without her, the family would be lost, but she’s taken for granted. The children adore her but the parents are wrapped up in their troubles, particularly their crumbling relationship and blame her for the things they could have done but failed to do. She saves the day time and time again and is a more loving mother to the children than their mother. The family witnesses major external events – an earthquake, an uprising, a forest fire, threatening ocean waves, teeming volatile streets, but they are remarked upon in passing, secondary to the day to day story of Cleo and the grace of her spirit. Cuarón brings in eastern philosophy, mysticism, reflected planes, dog poo, an unusual amount of water and other wondrous things, vibrantly and compassionately without judgment. Utterly mesmerizing and an emotional wallop, especially as it’s based on Cuarón’s own childhood maid. Protests about this being an example of a person of colour in service to wealthy whites, is another question altogether but don’t let it put you off experiencing Cuarón’s homage to his family’s maids. EDITOR’S NOTE: Roma is AWFJ’s Movie of the Week for January 25, 2019. The film won five 2018 EDA Awards: Best Film and Best non-English Language Film, and Best Director, Best Cinematography and Best Editing for Cuaron. Award winning writer Anne Brodie has covered film and filmmakers on television, print and online for nearly 30 years. Among her outlets are Metro News, Elle, More, AskMen, Monsters and Critics, Studio 12 News, Rogers TV and “daytime” TV.